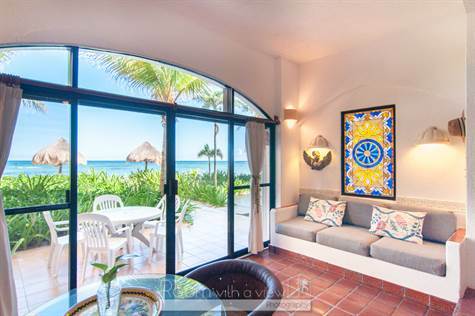 Incredible Ocean Front Condominium for sale in Akumal! Cool ocean breezes, magnificent sunrises over the Caribbean Sea and colorful sunsets over the tropical jungle can all be yours in this amazing 1 bedroom beach front ground level condominium on Half Moon Bay, walking distance to local restaurants, bars, dive shops and the incomparable natural beauty of the Yal-ku lagoon. This unit has a wonderfully airy feeling with seamless play between indoor and outdoor spaces, generous windows and spacious ocean front terrace. With all of the modern comforts of a fully equipped kitchen beautifully designed master bath, you will find life on the beach to be the ultimate in relaxation for you and your guests. The living areas offer stunning ocean views and direct access to the beach through your own private terrace. This lovely condominium is a sound investment for a vacation rental or to retire and start your future in paradise. *The owners of this building also collectively own a lot across the street which they rent out to neighbors for parking for which each condo receives monthly income.